Food is only as good as it is fresh and by taking air out and sealing flavour in with the FoodSaver®System, you can confidently nourish the ones you love. FoodSaver® vacuum sealing systems preserve the freshness and nourishing qualities of your food, reduce waste and help you lower your weekly food budget. 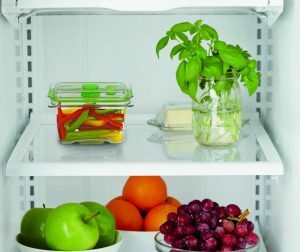 By using the tightest possible seals to prevent air and moisture from getting to your food, the FoodSaver® system prevents freezer burn while locking in nutrients, taste and freshness up to five times longer than traditional storage methods. 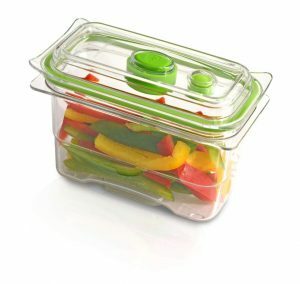 The FoodSaver® Fresh Containers are designed to be as flexible as your lifestyle – so simply store your food, reheat in the microwave (without the lid) and then clean in the dishwasher – easy! FoodSaver® Fresh Containers are BPA free so you can store and seal your food safe in the knowledge that your family can enjoy tasty and nutritious food with total peace of mind. 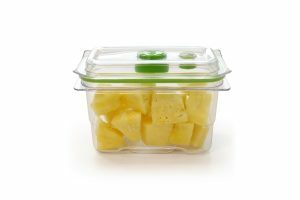 The FoodSaver® 475ml Fresh Container is great for storing freshly made food such as salads or delicious leftover meals – vacuum sealing technology means whatever your choice, food will stay fresh for up to five times longer.